Reverend Augustus William Watson was the vicar of Churt from 1884 until his death in 1917. He seems to have been a well-loved man, very interested and involved in the life of his parishioners. He started the Parish Magazine, the Churt Church Monthly, in January 1892. His opening sentence in the first magazine is: In starting a Parish Magazine for Churt, it is my hope that it may be a means of good to the Parish in many ways. It was very much a village magazine, reporting on not only church news, but everything else that went on in the village as well. It has been an invaluable source for this book about the First World War. The deaths of each of the serving men were all (nearly!) listed in the magazine and news of life on the home front in Churt was given in detail. It makes very interesting reading. 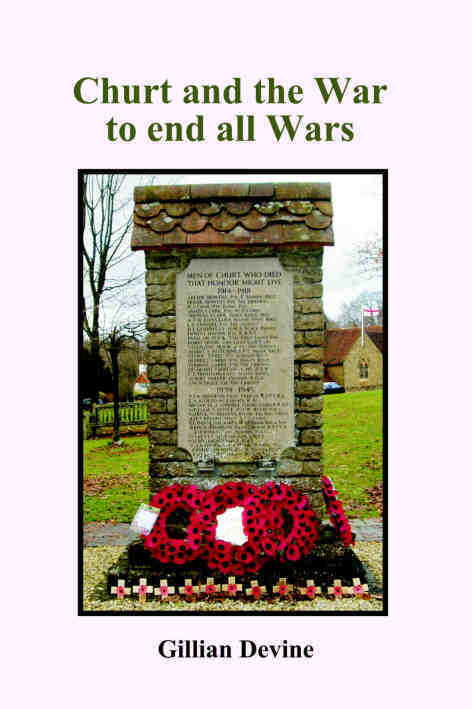 This book has been published, at the request of the Parish Council, in the year of the centenary of the start of World War I as a tribute to the people of Churt. The Churt Church Monthly has provided most of the information, supplemented, of course, by the internet! The year 2014 is the centenary of the outbreak of the First World War. Every year, on Remembrance Day, we hear the names of those men of Churt who died. Do we wonder who they were? In this book I have tried to put some flesh on those bones and tried to show something of what Churt was like 100 years ago and the impact of the war on the village. It draws most of its information from the parish magazine, a little from the memoirs of Will Croucher, who lived in the village for many years, and some from an article which appeared in Olivia Cotton's book, "Further Reflections on Churt", published some years ago. I must also thank Olivia for her suggestions for this book. Detailed information about the Trouton brothers was provided by a descendant of theirs, Anita Searle.